Stavros Manolagas, M.D., Ph.D., delivers the Louis V. Avioli Lecture at the American Society for Bone and Mineral Research's annual meeting in September. He also won the society's highest honor, the William F. Neuman Award. Oct. 2, 2017 | Oct. 2, 2017 | Stavros Manolagas, M.D., Ph.D., who holds several roles at the University of Arkansas for Medical Sciences (UAMS) and the Central Arkansas Veterans Healthcare System, received the American Society for Bone and Mineral Research’s oldest and most prestigious honor – the William F. Neuman Award – at the ASBMR’s annual meeting, Sept. 8-11 in Denver. The Neuman Award honors an ASBMR member for outstanding and major scientific contributions in the area of bone and mineral research and for contributions to associates and trainees in training, research and administration. 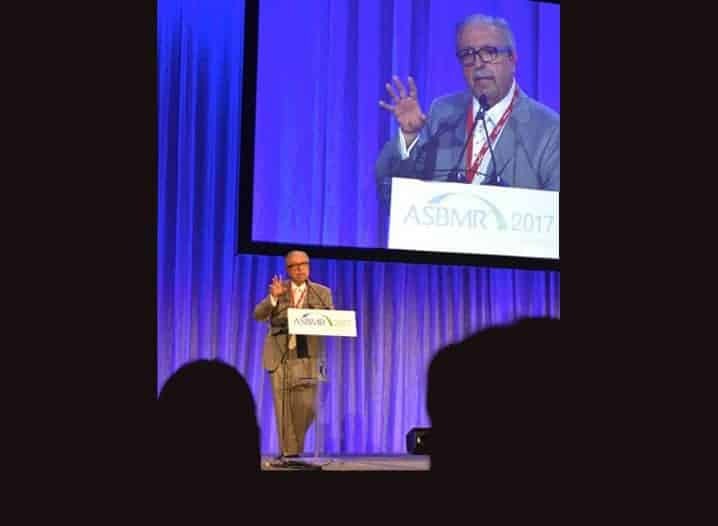 Manolagas also delivered the Louis V. Avioli Lecture during the meeting, the only invited plenary lecture presented by an ASBMR member at the annual conference, which draws as many as 4,000 physicians, scientists and other participants from around the world. This was the first time since the ASBMR’s founding 40 years ago that the Neuman Award and Avioli Lecture went to the same individual. Manolagas is a distinguished professor of medicine, professor of orthopaedics and director of the Division of Endocrinology and Metabolism in the Department of Internal Medicine in the UAMS College of Medicine. He is director of the UAMS and Central Arkansas Veterans Healthcare System Center for Osteoporosis and Metabolic Bone Diseases – one of the largest and longest-funded osteoporosis research centers in the world. In his lecture, Manolagas discussed the dramatic progress that has been made in understanding bone biology and the underlying mechanisms of osteoporosis over the past 40 years. He traced the advancement of pharmaceutical drugs for osteoporosis, as well as the work that remains to be done to develop therapies that continue to be both effective and safe with long-term use. Manolagas also serves as vice chair for research and holds the Thomas E. Andreoli, M.D., M.A.C.P. Clinical Scholar Chair in the Department of Internal Medicine at UAMS. In addition, Manolagas is chief of the Endocrinology Section in the Central Arkansas Veterans Healthcare System. His scholarly contributions have been recognized over the years with induction to the Association of American Physicians in 1996; the AlliedSignal award for research on aging in 1999; the inaugural Louis V. Avioli Award of ASBMR, 2000; a Doctor Honoris Causa from the National and Kapodistrian University of Athens, Greece, 2007; the International Bone and Mineral Society (IBMS) D. Harold Copp award, 2013; and the William S. Middleton Award of the Department of Veterans Affairs (VA) for achieving international acclaim for research accomplishments in areas of prime importance to VA’s research mission, 2016.